Austin Then & Now gives you the not-so-weird history of the Live Music Capital of the World, from Sixth Street and the University of Texas to little known corners of town that only the locals know about. What we call Austin today was once just a peaceful, lush little spot on the Colorado River with a pleasant view and easy living. For more than 10,000 years Man has lived in this area, more recently with modern Native American tribes such as the Tonkawa thriving among its abundant natural resources. When Texas was still in its Republic years, it was originally known as a town called “Waterloo.” After “The Father of Texas,” Stephen F. Austin, helped negotiate peace with natives so the area could be developed, the modern city was named in his honor. Today Austin is widely recognized as the one city the rest of America would miss if Texas actually did secede. 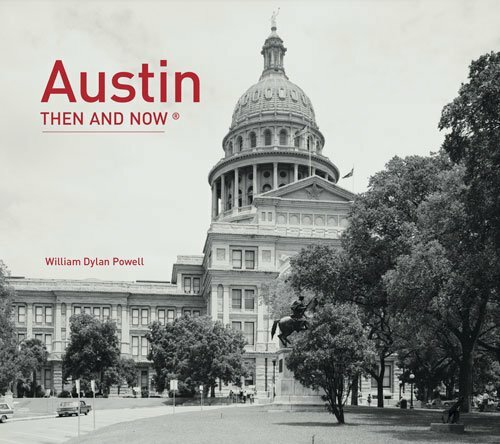 Austin Then & Now is a photographic exploration of Austin’s past and present—from the Republic of Texas years to the hipster-filled streets of today’s high-tech metropolis. Each spread reveals an old shot from Austin’s past, contrasted with a modern-day shot of the same composition: revealing how buildings, streets, institutions and the city in general has changed over the years. Its earliest subjects include the lavish Driskill Hotel, the Millet Opera House, the Old Bakery and Emporium, the Texas State Capitol, the University of Texas, the French Legation, the old movie houses of downtown such as the Paramount Theatre and the former home of writer O. Henry. The book also covers natural landmarks such as Deep Eddy, Lake Austin and Barton Springs—as well as old-time glimpses of streets all over downtown and beyond. Also included are funky modern landmarks that are 100 percent Austin—such as the fascinating Moon Towers made popular by the film Dazed and Confused, the raucous live-music-rich Sixth Street (formerly Pecan Street), the James Buford Tower, the Bat Bridge and more. It’s worth the price alone just for the beautiful historic mansions represented, including the old Pease Mansion and Pierre Bremond House. Order Austin Then & Now on Amazon and get your copy in two days with Amazon Prime!